Yup. I have mono. apparently. If this was my first time facing mono, I would accept the diagnosis at face value. But I actually had it when I was 19 in college, and apparently people aren’t supposed to get mono twice. So we have some investigating to do…do I have chronic mono? Or another condition as well that is compromising my immune system? The adventures will continue, but in the meantime, I am doing my best to rest up. For instance, I am typing this on my iPad while lying on my bed. But let’s return to the land of RVs and tour plans. After catching a wonderful concert yesterday by the tUnE – yArDs, Ross and I began a leisurely drive home through North Conway. After a great breakfast at Peaches, we stopped at our first Camping World. 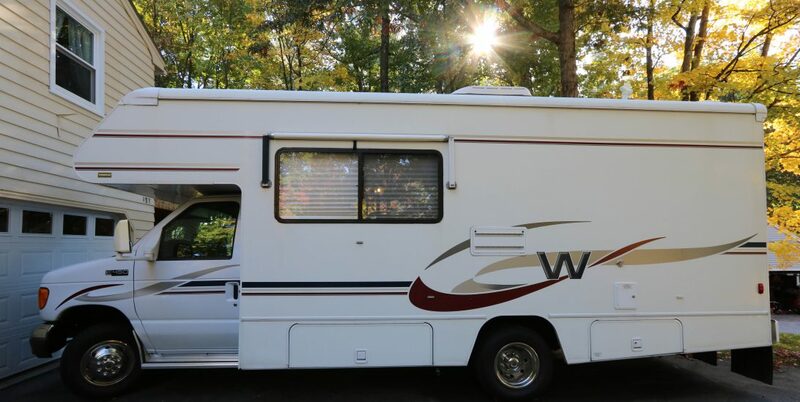 Although this one is extremely small compared to those I have seen other bloggers post about, I can see why they are a haven for RVers, both as a free place to crash and as a place to shop for accessories and (gasp!) RVs. We were mainly there for the class Cs. We were happy to hear they were open for us to peruse at our leisure, and we found a few that we really loved. Some were too big, some were too small, and some were just right. Four Winds had a few styles that we were crazy about, particularly a model with a bedroom slide that went out to the side, allowing more space for walking in the bedroom. We also found one used, and a Dutchman Express (used, 1995) also caught our eye as a very “us” model. Ross also had some great ideas about ways that I can market my work to churches while we tour, so I am really excited about seeing how that works out. We have so much planning to do but I am hopeful that in a year or so we can get out on the road. Lots of saving to do too of course! Our savings plans will get a kickstart soon. Ross finishes paying off his credit card debt this month (who-hoo!) so after that, he can save for the rv and touring gear. Likewise, I am on track to meet our Disney savings goals soon. Once that and an NYC trip are complete, I can really focus on the RV. Mono is not going to make it easy – how can I justify using extra energy for part-time, supplemental work? So I need to figure that one out. But I have faith that our dreams are possible, so let’s see what we can do. < Our First RV Show – And Our First Time Looking at RVs in Person!